Nikifor was born with a pronunciation defect, and little is known about his childhood, except that he did not know his father and that his mother was a cleaning lady in Krynica's guest houses. It is believed that she was probably mentally ill and that Nikifor inherited this illness. He spent much of his life as a traveling beggar and most of his days ill with tuberculosis. 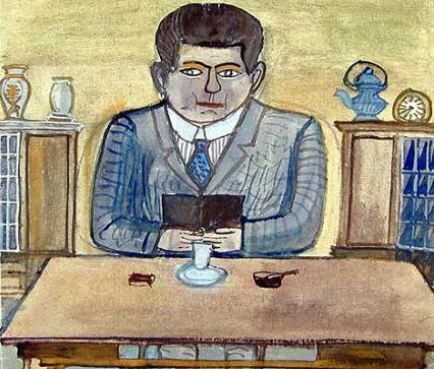 During a stay in the hospital, a doctor gave Nikifor a box of watercolors and thus, began his career as a naive painter. Painting not only became the way he earned a living, but also his reason to live. He sold his small paintings as souvenir postcards. The large letters on his pictures are mostly meaningless, since he could neither read nor write; however, sometimes the word "malarz" (painter) can be deciphered. Nikifor often painted himself as a person he desired to be, such as a respected official, the father of a large family or a bishop. He is considered Poland’s greatest self-taught painter.